BUT I LIKE HIM THAT WAY. HE DOESN'T TAKE ANY GUFF FROM ANYBODY. YET, AS A FRIEND HE'S TRUE BLUE, HONEST AND FAITHFUL...DOESN'T LIE TO MAKE A FRIEND FEEL BETTER; HE'LL GO THE EXTRA MILE TO HELP ONE GET BEYOND THEIR DELUSIONS. HE'S LEARY OF PEOPLE, AND ANGRY OF THE SELF-RIGHTEOUS ATTITUDES THAT ALLOW FOLKS TO SET TRAPS AND SHOOT WOLVES, BISON, ELEPHANTS AND OTHER ENDANGERED SPECIES FOR THEIR PELTS, IVORY, OR BECAUSE THEY DON'T WANT THEM HUNTING THE ANIMALS THEY WANT TO KILL SO THEY CAN PUT THEIR HEADS ON THEIR WALL, OR IMPRESS THEIR FRIENDS WITH A DESIGNER COAT MADE OF AN ANIMAL'S BODY, OR BECAUSE THE WOLF OR FOX KILLS A CHICKEN OR LAMB OR CALF THAT THE BREEDER WANTS TO KILL TO MAKE MONEY BY SELLING IT. KAYO SAYS THAT NO ANIMAL KILLS FOR FUN; THEY KILL AND EAT ONE ANIMAL, CHOOSING THE WEAK OR SICK...AND THEY EAT EVERY PART OF IT, NEVER TAKING MORE THAN THEY NEED...AND CARRION BIRDS AND OTHER ANIMALS CLEAN UP ANY LEFTOVERS. KAYO NOTICED QUICK ENOUGH HOW PEOPLE TAKE FROM THE EARTH AND DON'T PUT BACK, AND HOW THEY KILL THOUSANDS OF ANIMALS JUST SO THEY CAN HAVE PARTIES AND DECORATE HALLS WITH FOOD TO IMPRESS EACH OTHER, THEN THEY THROW HALF THE STUFF AWAY AND DON'T EVEN GIVE IT TO OTHER PEOPLE IN NEED. HE JUST SNORTS SMOKE WITH HE THINKS ABOUT IT! I HAD A BIT OF A TASK GETTING HIM TO TRUST ME, MY BEING A HUMAN-TYPE BEING, AND ALL...I CONVINCED HIM THAT I TRY MY BEST, AND AM WILLING TO LEARN ALL I CAN AND TRANSCEND MY SHORTCOMINGS. AFTER AWHILE HE TOLD ME ALL ABOUT THE BEAUTIFUL HOME HE'D LEFT...NOT BY CHOICE, BUT WHEN MT. ST. HELENS ERUPTED, Y'KNOW, HIS HOME WAS CAUGHT BETWEEN THE IMPLODING EARTH...HE EMERGED, COUGHING AND SPLUTTERING THROUGH A CREVACE NEWLY CREATED WHERE HIS FAVORITE MUD BATH HAD STOOD... IN MIDDLE EARTH HE'D ENJOYED A WATERFALL 40' FROM HIS CRYSTAL CAVE, AND EXOTIC PLANTS THAT GREW ON VINES FROM THE ROOTS OF OUR TREES! UNTIL HE FOUND HIMSELF AT THE DOOR OF ADOPT A DRAGON FOUNDATION, POOR KAYO SNOMO HADN'T SEEN ANOTHER DRAGON IN 37 DAYS, 3 HOURS AND 42 MINUTES~I'M AMAZED AT HIS MATHEMATICAL WIT! 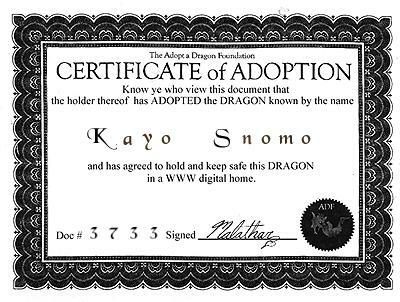 I'M PROUD TO DISPLAY THE ADOPTION CERTIFICATE THAT MAKES KAYO AND I OFFICIAL FAMILY!! HE'S A GREAT GUY, AND HE AND I WANT TO EDUCATE PEOPLE ABOUT HOW JUST BECAUSE SOMEONE LOOKS DIFFERENT, THEY MAY BE VERY MUCH THE SAME AS OTHERS. TO READ ALL ABOUT BUDDY AT WILLOW'S TRANQUIL SITE. UNFORTUNATELY, THE MANY UNIQUE HAND-DRAWN DRAGONS ARE GONE. COULDN'T RESIST ADOPTING THEM, OBVIOUSLY! this page created 8/18/98~~Princess G's Birthday!! This was fun, to imagine having a Dragon in my Family! With Love to You Like Minds and Gentle Spirits!